Jen Wang, graphic novelist and founder of the Comic Arts LA comics festival, will be at ESA for the morning this Monday, May 14th. Jen will be work-shopping the Grade 9 and Grade 10 Visual Arts classes. Can’t make it during the morning? Everyone in the ESA Community is invited to join us for lunch, in the Library, with Jen. 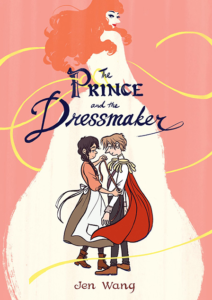 Didn’t sign up for a pre-ordered copy of her latest graphic novel The Prince and the Dressmaker – a thoroughly modern day fairy tale? Never fear, you’re in luck! Our friends at The Beguiling shipped us some additional copies. If you would like to purchase one of these additional copies, please complete this Google Form to advise. We will monitor the activity on the Google Form, and when we have SOLD OUT… the form will no longer accept responses. PLEASE NOTE: Completion of this form is a COMMITMENT to pay for the book. Please send in $20 with the student in your house – or bring in $20 when you join us for lunch.